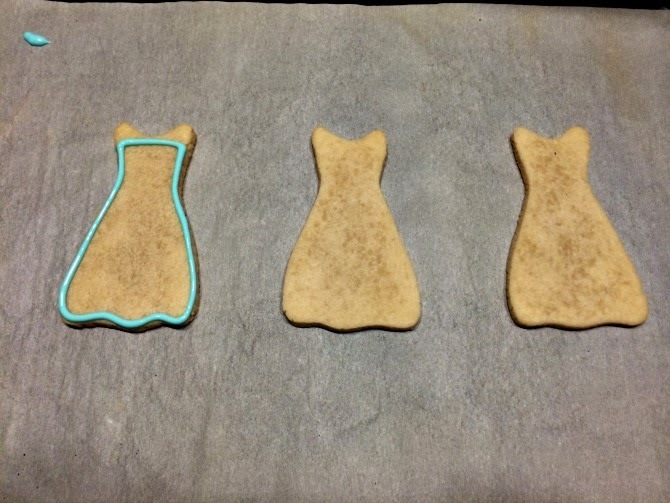 I have tried on several occasions to document my cookie making process. But once I get in the cookie zone, I always forget to stop and take a picture or two. So here is my first attempt at showing you how I work. 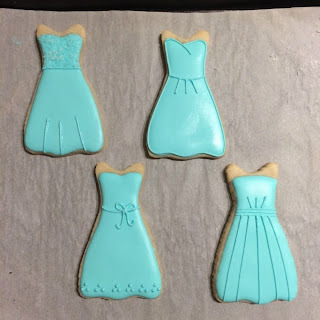 A client contacted me recently about bridesmaid dress cookies for her daughter (the bride) to put in a little gift box she was giving to each of her friends, asking them to be in her wedding. Other than telling me the wedding colors (robins egg blue and coral), she wasn't exactly sure how she wanted them to look. I'll admit that creativity is not my strong suit, so it's always stressful to me when I don't have a lot of guidance for design. However, after asking a few questions and getting more information about the event in general, I was able to formulate a few ideas. Since the request was made fairly last minute, I wasn't able to get a cutter that looked exactly like what I had in mind. So I drew my own template to use for the cookies. I usually don't accept last minute requests, but I already had extra dough and royal icing left over from a recent project, so I was able to accommodate the request. Step 1: Roll out the dough and cut the cookies. It helps to freeze the dough for a few minutes after rolling it out so that it's firm when cutting, especially if you aren't using a cutter. I roll my dough about 1 cm thick. If hand cutting, just run your finger along the edges to smooth out any rough spots. Step 2: Color the icing. This was day 2 of this particular order, so the cookies are fully cooled. I started off with just a toothpick tip each of Sky Blue and Turquoise (I prefer the Americolor brand), and continued to add dots of color at a time to reach the shade I wanted. 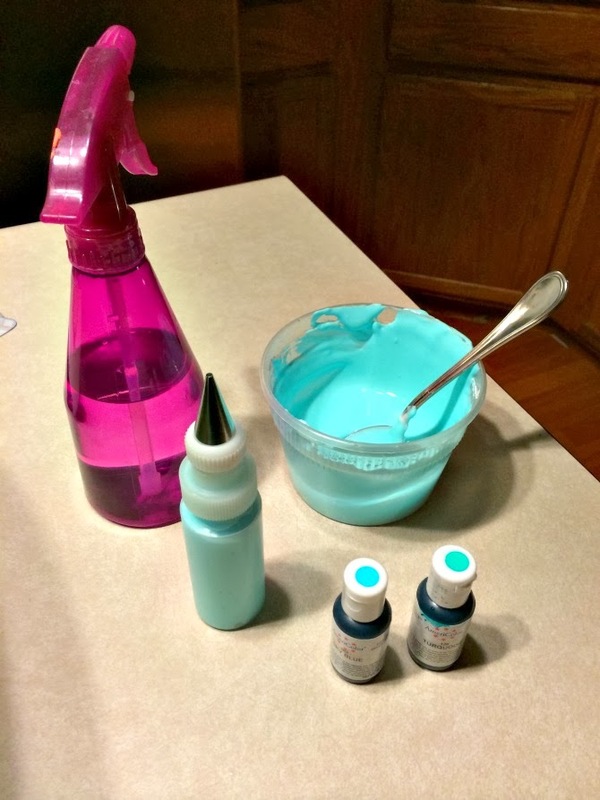 I use the spray bottle to thin out the consistency of the icing. This was a life saving tip that I learned from The Sweet Adventures of Sugar Belle, as it helps you avoid adding too much water at a time. 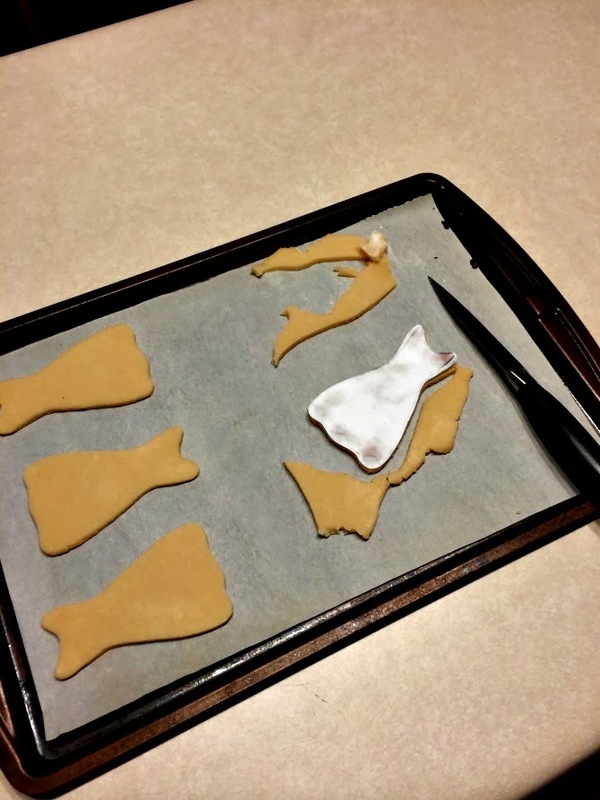 If you are interested in trying cookie decorating, her blog is full of amazing tips. Step 3: Planning the design of the cookie. I already had a few ideas in my head, but wanted to draw out what I was thinking so that I could ice the cookies correctly. Sometimes a design involves icing sections at a time, and obviously figuring that out after the fact is never a good thing. I like to trace my cookie cutter a few times and draw out my ideas before I actually start decorating. Step 4: Outline and flood the icing. For these, I didn't want the outline to be obvious, so I used the same consistency to outline and flood. I just used a smaller tip (#2) to outline, and a #3 to flood. After flooding the cookies, I swirled a clean toothpick around to pop out any bubbles, and merge the flooding and outline. 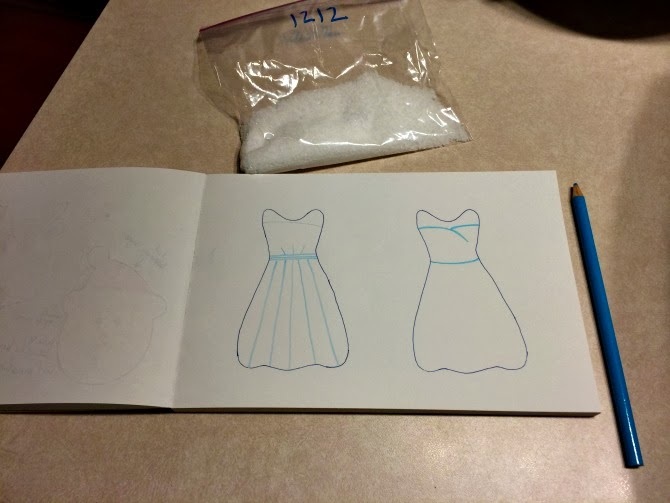 I played around with two different necklines on these to determine which one I liked better. Step 5: Adding detail. After the cookies dried, I added the next layer of detail. I always make extra cookies to finalize the design, and I love that it gives me the chance to play around a little (like the cookie in the top left corner where I used sanding sugar). When they were all finished (and I took a little vote via Instagram), it was decided that the bottom left cookie was just perfect for a June ranch wedding. 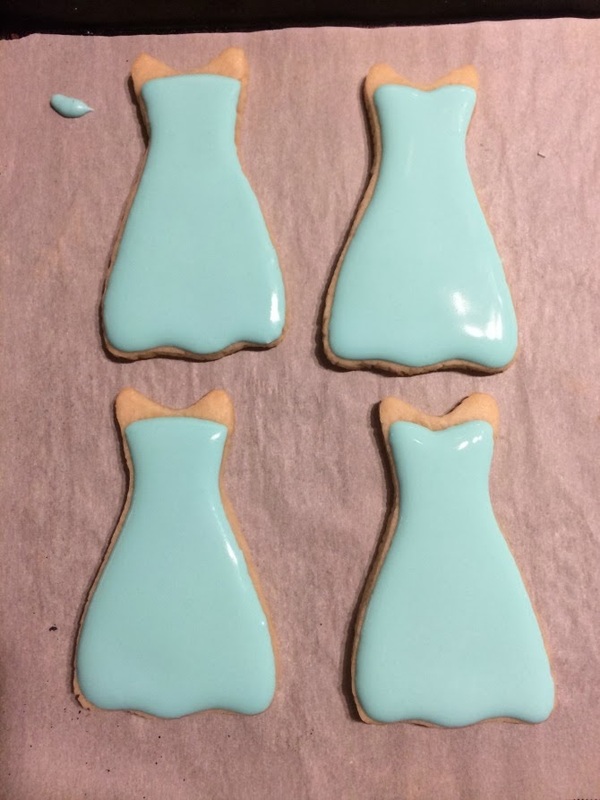 I typically place each cookie in a cellophane bag and tie with coordinating ribbons, but the bride wanted to do that herself and add a "Will you be my bridesmaid" tag on them. I think this is such a fun and special idea, and I so enjoyed playing a part of it.